The Files tab in your Workspace will display files that are uploaded to the Workspace and/or entries that you have selected. Files can currently be organized by Workspace and/or entries. 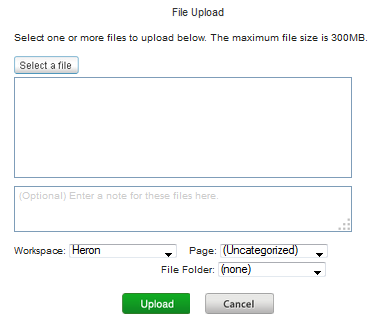 Files will appear in the Files tab for a page when files are uploaded using upload fields in Web or Application Forms. You can also save files using the Files Tab. To add a file to given workspace and/or page click on Add in the Files Tab. Select “Upload Files”. Select a file using the “select a file” button and then identify the Workspace, entry and file folder that the file should be associated with. Subsequently click “Upload” to complete the upload. If you upload it to the wrong Workspace and/or entry you can move it later. You can also create a file folder to move one or more files to. Once you have created a file folder you can drag and drop files to that folder for ease of reference. Additional Actions can be performed on Files that have been uploaded via the form or via the Files Tab. To view the available actions, click on the Actions icon to the left of the file name in the list on the Files Tab. Download: Downloads the corresponding file. 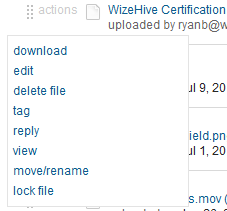 Edit a file: This opens the WizeHive editor that allows you to upload the files that have been uploaded. Delete a file: Removes the file from the Workspace. If multiple versions exist then each will have to be deleted (i.e. 2 versions require you to delete the first, reload tab, delete the second). Tag a file: Allows the user to attach tags to the file. Reply to a file: Allows you to reply with a note to the file. View a File: Opens the file viewer in WizeHive. Move/rename files: Allows you to pick a different workspace and/or record to store the file to. It also provides the option to rename (rather than move) the file. Simply give the file a new name, and keep the workspace and record name that existed in tact. Save your entry. Lock/Unlock file: Locking a file makes it uneditable, unlocking a file makes it editable. From the Files system tool page your functionality will be the same as you saw on the My WizeHive level. The most important difference to note is that at the Workspace level you will only see Files that are associated with this workspace. Remember at the My WizeHive level you can see Files for all workspace that you are associated with. While our system accepts most type of files, we cannot guarantee that all files will convert successfully to be previewed through a WizeHive feature (such as the Private Review Portal & Backend of the system). When a problem file in encountered please take reasonable steps to remedy the issue including requesting a new file from an applicant. If you request that WizeHive convert, "fix", or otherwise manipulate a file that is unable to be previewed then we may need to charge on a per applicant basis to convert the file. Please Contact us if you have questions or require assistance.
. PDF Most common File type. Sometimes have trouble with Security Settings that will prevent viewing on the backend. Please review the type of PDFs you accept before starting you process.
. DOCX, .DOC (Word Docs) Generally avoids any trouble. Not as static as PDFs but very useful.
. XLX, .XLSX (Excel) While able, it is NOT RECOMMENDED to rely heavily on viewing these types of files in the backend.
. JPG, .PNG, .GIF Accepting High-resolution photos should be tested prior to starting your process.
. MP4, .MOV, .FLV, MP3 Pay special attention to file sizes when accepting lengher video or audio files. Files are currently limited to 1GB per file. You are not limited to the number of files that you may upload, not the amount of total storage space. You can limit the size of the file upload that you want to accept in the field settings, and you can also modify template text to note the change in size limitation.